A new era of concert presentation commenced in 2003 with SEL taking up the producer’s role for future Mission Concerts. The first artist to appear under this new agreement was Sir Cliff Richard. 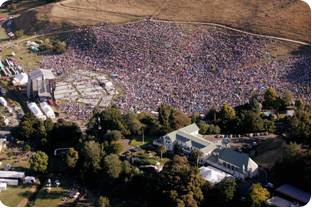 The Mission Concert site was identified by Sir Cliff as a spectacular venue, not only an ideal location for the final performance of the Wanted World Tour but the perfect venue to record the performance for the Wanted World Tour DVD release. Since 2003 the Mission has hosted John Farnham, Belinda Carlisle, The B52’s, Rod Stewart, Chris de Burgh, Olivia Newton John, Eric Clapton, Motown, Sting, Carole King and Barry Gibb.